Dear future Bride & Groom, congratulations on your newly formed commitment and do draw your attention to the following. Since you’re planning to get married, it would be well worth your time to imagine and consider something along the likes of an idyllic dream-like Skiathos wedding. Indeed, ask yourself this question: Why not be the star of your very own picture perfect wedding in Greece? Just imagine having your wedding day under the warm sun in a romantic Greek island, all your dreams for a romantic wedding being realized by the crystal blue waters of the Aegean. 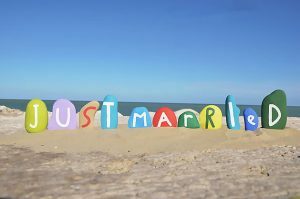 Fortunately, your dreams can become reality with Skiathos Island, an excellent choice for a wedding destination indeed. Famous for offering a most romantic setting amidst uber-blue waters- it very well could be your personal dream-come true of a lifetime. For all that this Greek Island holds as being part of the Sporades group of islands as set in the Aegean Sea- it is nothing short of an amazing wedding destination pick. Boasting no less than 70 sandy picturesque beaches, you will be grandly rewarded by indulging in the romantic aura of this magical place. The idyllic beaches of Skiathos as backdrop undoubtedly serve for a magical wedding, and covered in pine forests and olive groves making for a lush, green landscape; coupled with idyllic beaches and the most serene atmosphere- you will definitely not regret to get married in Skiathos. One truly unique and ideal location for a Skiathos wedding, is the Bourtzi. This small peninsula used to be a fort, which now offers spectacular views of the uber-blue Aegean that will undoubtedly add a magical ambience to your Skiathos wedding. By opting for one such historic Bourtzi wedding, you will also get to enjoy the actual site where the entire crew of Mamma Mia were taking breaks between sets during the summer of 2007! As a matter of fact, weddings in Skiathos have become quite synonymously tangled with the Mamma Mia film and its feel good, romantic factor. You may also opt for a more traditional kaiki boat from the old port, similar to the one caught by Colin Firth and Pierce Brosnan in the film. In addition, weddings in Skiathos may also take place at other venues upon request. Skiathos offers great locations and hotel for unforgettable weddings, some with their own licence of ceremony which can host your whole reception too. For instance, your Skiathos wedding reception may take place in a traditional beach front taverna, a chic restaurant in town or a boutique hotels. As far as these luxury boutique hotels go, they are undoubtedly some of the best places to experience true romance and enjoy ultimate privacy and relaxation. Some of Skiathos’s top hotels will offer wedding packages that include absolutely everything you need for your special day, such as a wedding Cake, Buffet or Sit down Meal, Table Decorations, Photographer and Video Service, Hair & Beauty Salon, Music & Entertainment, Accommodation and a Wedding Planner. Other ideal wedding venues furthermore include the historically rich churches around the island, which are perfect for orthodox weddings. As for the whole wedding plan you can find some offices which among others undertake wedding organization but if you are looking for real professionals we strongly recommend to talk first to the girls of “Fresh Ideas“. They are creative and plan every detail so that you don’t need to worry for anything the most important day of your life. Skiathos is a beautiful place to get married with its amazing scenery, romantic settings and glorious sunshine. For all the reasons listed above and more, Skiathos island offers one of the most romantic and breath-taking wedding venues that all the world could possibly offer in terms of wedding destinations. So go on and let the magic unfold, take a trip down the aisle you will never forget!